Eenie meenie minie mo, to which pub shall we go? By Steve Foster. After a bit of dithering about we decided at the last meeting that we would return to the Shoulder of Mutton for the last Thursday meetings until summer is with us and then we will go back to the Phoenix again as we can be in the car park kicking tyres. The Phoenix smoke was too much for many members last meeting there (wasn't it, Brent!). 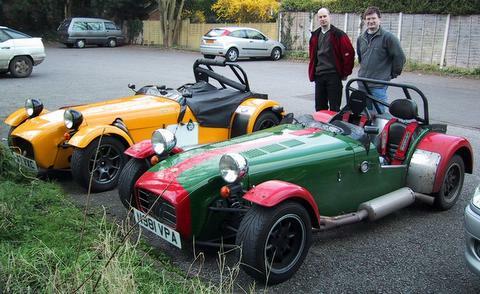 Jason, Phil and I went for a nice blat on Bank holiday Monday. The roads were pretty clear on the way up to the Henley area. We stopped for tea (cup of, not pint) and then blatted back to Phil's to survey his ongoing projects. A pic or two may pop up somewhere in the mag (Ed allowing). Hope the resolution is high enough, Ed? All photos are by Steve Foster. The Xtrac visit will be on the 2nd of June, evening. If you like hi-tech race stuff, cogs and are HN&B, then pop the date in your diary. More details to come nearer the time and these will be distributed via the meetings and email. 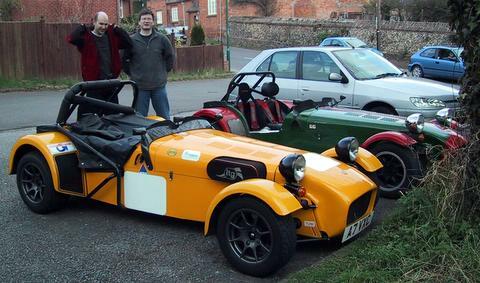 Well, after months of just turning up and drinking Andy W actually drove his 7 to the meeting - Well done Andy. The 7 has even been on track recently. Not sure about Andy though?! Brent is upset cos his SV isn't progressing, and has to miss the Thursday meeting as it's his wife's anniversary. Notice how anniversaries are always something the wife has... Tony W is sending the transcript of the Blatchat thread as I write, Brent :-). Andy W pointed out that Den bought two drinks last meeting. At least you were sober enough to count this time Andy! 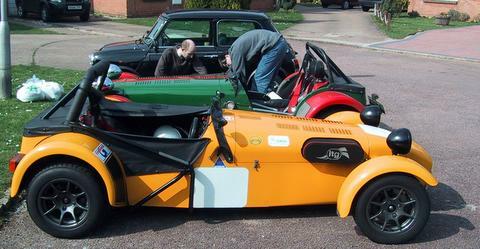 Jason has fitted a Brise all turning all dancing starter and so far no 'CLICK' but wiv, wiv, vroom every time. Could this be the end of one K-series tale of woe? Bill on the hill is flogging a new flash Wideband bit of kit. I have used his system to map my throttle bodied EFI. I am working away at getting him to join the club... Well, it wouldn't be the first time a W******d owner belonged would it! Chip is thinking academy 7. One of those won’t go like a big VX though Chip ;-)! Nobody has seen Ray H for ages. Rumour has it that he’s run off to Marbella (chav lesson: pronounced Mar-bej-ya) with the club funds. He bought the 21 last year. That started talk about where the money came from and now this! Can anyone confirm? Phil W has been looking after his wife and when time allows bolting on throttle bodies, making up an ECU from a kit and a natty wheel mounted shift light set up. Estimated date for the 7 hitting the road is mid- to late-April I reckon. Well that’s it for this month. Toodle pip. This page is http://www.strangely.org/7club/meetings/200503/index.html. It was first published on Friday 8 April, 2005 and last updated on Wednesday 25 May, 2005.